Customers judge your performance and return to buy from you again based on your speed and quality of response, your on-time delivery commitments, and your customer service across all contact points. ERP for Distributors: What Matters and What Doesn’t? 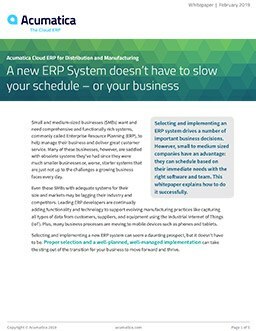 New white paper walks you through the key considerations for your ERP selection process. You’ll save hours and avoid slowing down your business. To meet demanding customer expectations, you need a team dedicated to listening to your customers and empowered to act quickly on customer requests. The entire team must have access to accurate and timely information. To best serve customers, you must know the customer. Acumatica offers purchase order software integrated with its cloud enterprise resource planning (ERP) solution that helps distributors like you grow your business and offer exceptional customer service. Acumatica offers a single integrated system automates the entire quote-to-cash cycle. The best forecasts start with accurate historical data and current demand and leading to better decisions about the products and services that are in demand. Having the right stock in the right place leads to better customer satisfaction, higher revenue, and optimum inventory investment. Integrated fulfillment systems capture and deliver the data that underlies this successful process. This is now a “wired eCommerce business world.” Distributors who do not have plans to implement eCommerce functionality have already fallen behind. Acumatica’s e-commerce solution is tightly integrated with customer management, order entry, inventory, order fulfillment, and accounting. “Omnichannel” support provides the flexibility to support direct customer ordering, distributors, and B2B with a similar customer experience, whether the individual contacts you through desktop browsers, mobile devices, brick-and-mortar stores, or catalog sales. Customers may access your site from multiple locations, at various times and from different devices, while coordinating with other decision-makers during their process of research, comparison, and ordering the products they plan to purchase. Acumatica’s Sales Order Management software improves the total experience of employees, customers, and suppliers.